Entering Super Bowl 51, it seemed the Patriots’ best—and maybe only—chance was to keep Atlanta’s electrifying offense off the field. Sure enough, the Falcons finished with 46 snaps in Super Bowl 51, 18 fewer than the NFL average in 2016. But the game’s biggest factor wasn’t that Atlanta’s offense was off the field. It was that Atlanta’s defense was on it. A lot. For 93 snaps, to be exact. Naturally, fatigue set in. And that’s the biggest reason why the Falcons suffered the greatest collapse in Super Bowl history. It’s worth examining exactly how those 93 snaps exhausted the Falcons. For starters, 93 snaps equates to playing a game and a half. Then factor in the adrenaline of that game being on the Super Bowl stage, and what happens to a player’s energy as that adrenaline wears off. Then add in the halftime, which is twice as long as usual. Yes, that gives your body more time to rest. But it also means your body must operate on an unfamiliar internal clock. Over your previous 18 games, your body had grown accustom to its halftime routine. Oh, and speaking of 18 games, that, too, is a lot. Its cumulative effect magnifies the toll of those 93 snaps. More importantly, however, was the style of snaps the Falcons were playing. As expected, they defended the Patriots primarily with man coverage. When a defender plays man-to-man, he’s chasing an offensive player all over the field. That’s considerably more taxing than sitting back in zone. Furthermore, Falcons defenders often matched to specific receivers in man. With the Patriots’ limitless supply of formations, those defenders were often crossing the field back and forth before the snap. Because chances were, if a defender’s man aligned in, say, the left slot on one play, he very well could be aligned near the right sideline on the next. The 35- to 40-yard jogs that a defender takes to follow this add up. In fact, many NFL coaches who play man coverage will implement extra snaps of zone or limit their specific man-matchup calls in order to mitigate fatigue. Mind you, this is all just with the secondary. There are also defensive linemen, who wear down faster than any position. They’re constantly firing off the ball and wrestling with 300-pound blockers. That’s why Dan Quinn, like the rest of the NFL, employs a deep rotation up front. But on 93 snaps, even rotating defensive linemen succumb to exhaustion. That’s what happened Sunday night. As the Falcons’ back-seven defenders grew tired chasing receivers before and after the snap, their front four grew tired chasing Tom Brady. The declining pass rush became a problem, including when the Falcons did play some of their staple Cover-3 zone in the second half. With the D-line tiring, the pressure that had been hounding Brady (he endured five sacks and about three times as many hits) dried up. Dwight Freeney stopped eating left tackle Nate Solder’s lunch. Grady Jarrett, who was sensational, flashed less. Vic Beasley no longer made noise. And that’s when the greatest quarterback of all time rediscovered the precision accuracy that had evaded him for the first three quarters. With Brady in a clean pocket and throwing in rhythm, the Patriots had no trouble moving the ball. This is where people want to assign blame. Quinn played too much man coverage! Matt Ryan and Kyle Shanahan blew it in crunch time, forcing Atlanta’s defense back on the field! No. • THE GREATEST COMEBACK EVER: Tom Brady’s season started with a four-game suspension and ended, in dramatic fashion, with his fifth championship after the Patriots overcame the largest deficit in Super Bowl history. The man coverage had been working—that’s why Quinn kept playing it. The Falcons specifically had success in man-lurk coverage, keeping a free defender (safety Keanu Neal or linebacker De’Vondre Campbell) in the shallow middle. That lurker took away New England’s crossing patterns and allowed the Falcons to switch coverage assignments on the fly—Brady failed to recognize one of those switches when he threw the pick-six to Robert Alford. As for Atlanta’s offense, to say that Ryan and Shanahan blew it is absurd. If the Falcons had given their best performance, would they have registered more than 46 snaps? Absolutely. But understand: the game didn’t flow that way, plus Ryan and Shanahan stayed aggressive late in the fourth. After Danny Amendola’s touchdown made it 28-20 with just under 6:00, the Falcons called a first-down play-action deep shot. Ryan checked it down to Devonta Freeman for 39 yards. Two plays later Ryan rifled a gutsy ball into double coverage to create an incredible sideline catch by Julio Jones. But after that, unfortunately, the Patriots broke down Atlanta’s protection, with Trey Flowers getting inside for a late-in-the-down sack (maybe Ryan wrongly held the ball, maybe he didn’t; we can’t know without seeing the all-22 film) and with Chris Long drawing a hold against left tackle Jake Matthews. On previous Falcons drives, there had been protection mistakes, both physical and mental, leading to sacks and a turnover. Those aren’t quarterbacking or offensive coordinating issues. 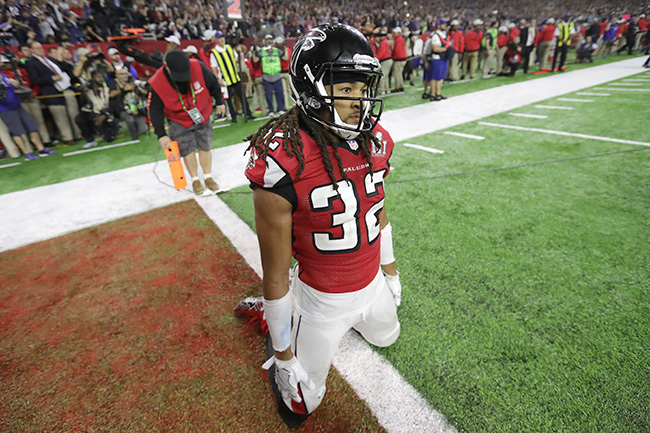 The reality is Atlanta’s defense was simply on the field too long. It wore down. If you’re a unit built almost solely on speed, that’s a problem big enough to cost you a Super Bowl.